22 Earthquakes in 19 Days and the Worst is Yet to Come. | Chaos Sweeps Away the World We Know! The Disaster, current events & Catastrophe Blog. Forecasts for 2014 to 2022. Read tomorrows news today! Plus current economic, commodities, stock indices and financial news. ← U.S. Pacific Northwest Destroyed by Earthquake and Tsunami! April 19, 2014 – 22 Earthquakes in 19 Days and the Worst is Yet to Come: The USGS generated chart above reflects 22 quakes in the first nineteen days of April, 2014. And these were not small baby shakes, e.g., we had a grand daddy 8.2 in Chile and several other powerful earthquakes as you can see by the map. The latest victim was Mexico with a 7.2 magnitude quake on land. 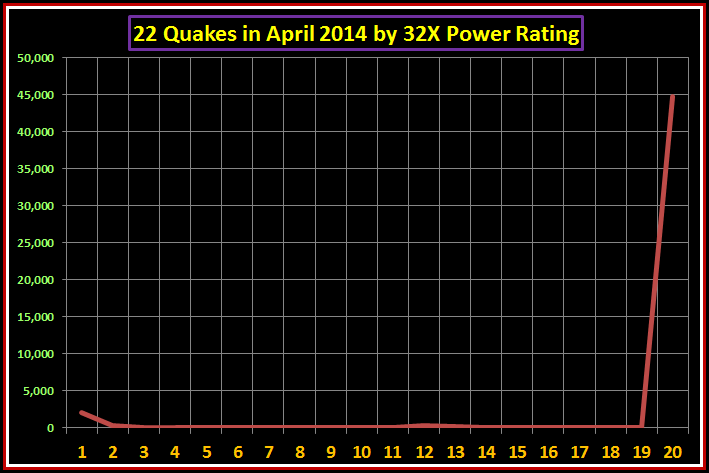 The graph above shows the 32X USGS Derived Earthquake Power Rating. 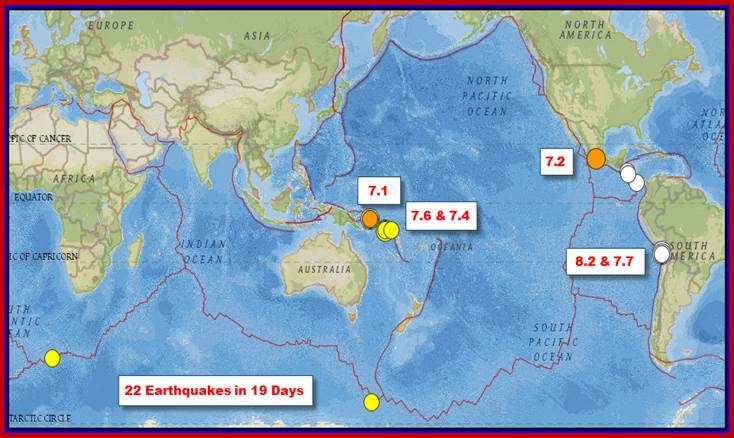 You can clearly see how strong the 8.2 AND 6.9 magnitude quakes where based on this rating. Pretty small bump on April 1st. Now look at the projected quake. I put it in for April 20th but I’m guessing April 23rd or 24th. What a dramatic difference in strength. This means that he 9.2 to 9.4 magnitude quake I’m projecting for PNG (Paupa New Guinea) is going to generate a tsunami of unbelievable size and strength. How high is that? Over 200 to 300 feet in the immediate region. The Philippines are toast. Japan will suffer greatly. Hawaii will see some very big waves, as will North America; especially Alaska, Canada, the U.S. and Mexico. 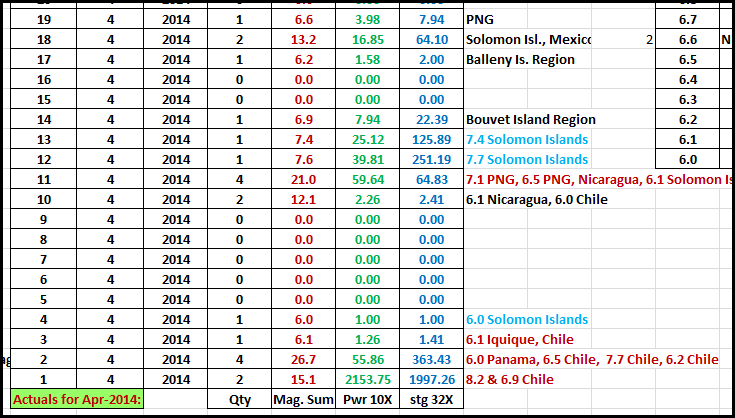 This Excel Spread Sheet reflects the 22 earthquakes in April 2014. The column with black single digits are the quantity of earthquakes that day. The red numbers are the combined magnitudes, the green numbers the 10X rating (most often quoted on the news) and the blue 32X numbers. April 1st has a 32X rating of 1,997 while a massive 9.1 has a rating of 44,668. Therefore, it is time for the havoc to begin. Tomorrow, and the next three days to April 24th are the prime immediate danger Zone. This entry was posted in Brazil, California, Canada, Chile, Chile-Bolvia, Death, Disasters, Earthquake, Events, Forecast, Indonesia, Japan, Mexico, Mundane Astrology, Papua New Guinea, Papua New Guinea, Philippines, Philippines, Predictions, Quakes, South Pacific Ocean, The Solomom Islands, United States. Bookmark the permalink. 2 Responses to 22 Earthquakes in 19 Days and the Worst is Yet to Come. A very good survey of what has happened, is happening and going to happen! As you know, the main tectonic plates have veins running across the whole globe. Areas not prone to large quakes must take heed and prepare for the ripple effects from the very large quakes in and and around the ‘The Ring Of Fire’. Other adverse climate conditions will pound the globe on a greater scale too. Dimensional change is in motion and the elite know this and are powerless to do anything about it. Their chemtrails are a complete waste of time by the way!! !